Bonfire night is a historical tradition in Britain dating back to 1605 when Guy Fawkes and 12 other men conspired to blow up the houses of parliament. It is a celebration that many of us enjoy with family and friends, traditional food such as toffee apples, treacle toffee and parkin as well as a bonfire and fireworks. For many this celebration will become something that they remember for the rest of their lives, but not because of the fun they had. 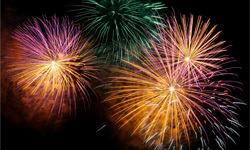 Hundreds of children and adults will be scared for life due to injuries caused by fireworks. It is a great worry when public figures like Man City’s Mario Balotelli use fireworks in a dangerous manner. He is a role model for many young children, who emanate the actions of such public figures. It is a hard enough problem to tackle without having to counter balance such actions from famous role models. One of the safest ways to enjoy bonfire night is to attend an organised event. The bonfire and fireworks are usually a safe distance from the spectators and those who are setting light to the fireworks are responsible people. If you are having a bonfire at home be aware of the dangers and how to make it a safe event. If you are giving your children sparklers ensure that they wear gloves and never let them pick up a sparkler that has been dropped. Sparklers can get up to six times hotter than a pan of cooking oil. When the sparkler has finished place it into a bucket of water. Always supervise children when they are using sparklers and ensure that they keep them at arms length and away from others. Keep fireworks out of reach from children and in a metal box to prevent them getting accidentally ignited. Never return to a firework that has not gone off. Always act in a sensible manner around fireworks and never throw them at anyone, hold them in your hand when lighting them or put them into the bonfire. Walk away if anyone acts in an irresponsible manner, what may seam like fun could end with life long scars. Ensure that you know what to do in the event of a someone getting burnt. Have a first aid kit or burns kit at hand. Act quickly and where injuries are severe seek medical advice.